"History is more or less bunk. It's tradition. We don't want tradition. We want to live in the present, and the only history that is worth a tinker's damn is the history that we make today." 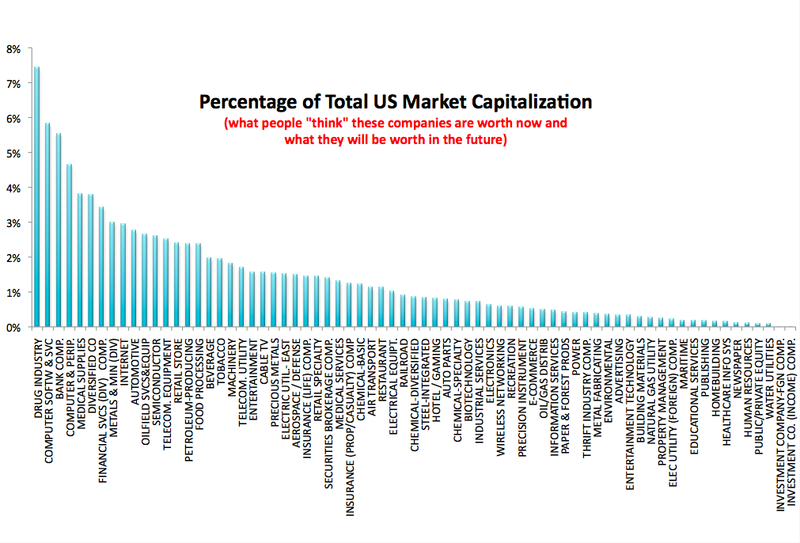 Largest market capitalization, percentage-wise, is found in the Drug Industry followed by Software, Banking, and Computers & peripherals. These are the industry sectors that investors, small and large, "think" with give them the best return now and in the future. Whether this means that these industry sectors are actually the best place to put there money or the ones that contribute the most to society is a very different question. 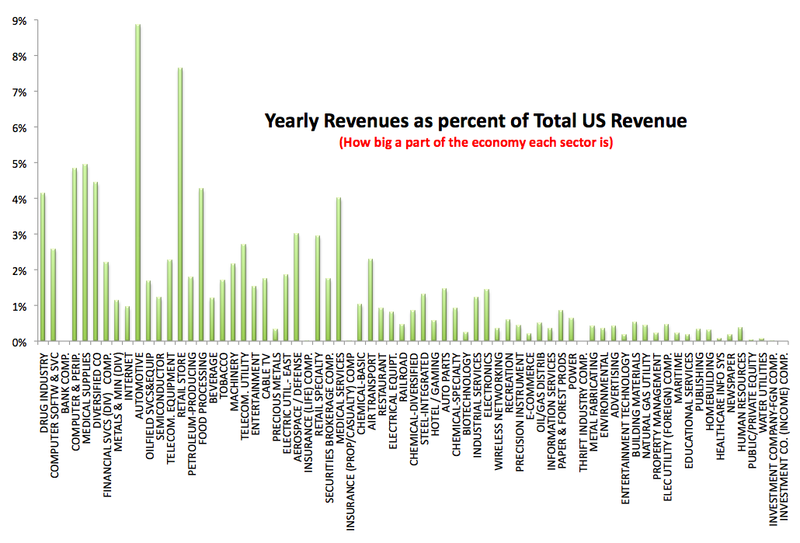 Interestingly the industry sector with the largest revenue is Automotive followed closely by Retail Store. Thus when it comes to money (and employment) coursing through the economy is dominated by these two sectors. 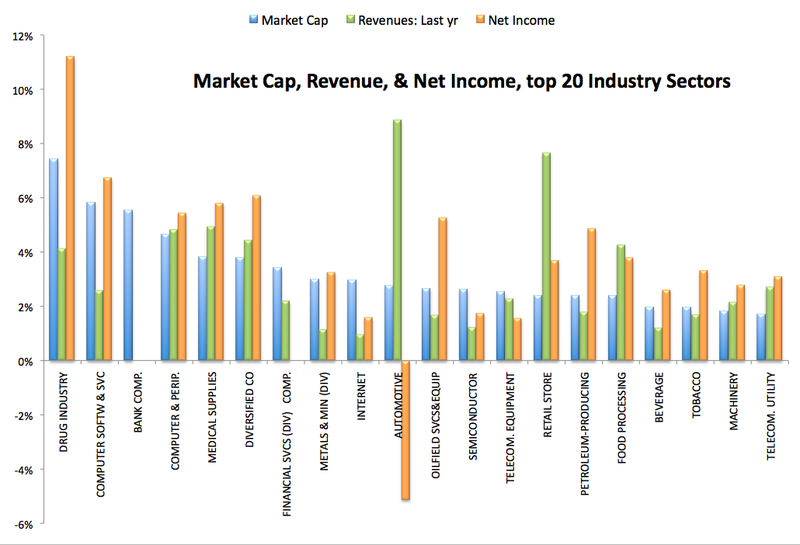 Note that these two sectors are in the middle of the pack as it has to do with market capitalization. Thus simply put the industries that have the most influence on the economy are not the ones that people think are going to be the most successful or the ones they can make the most money investing in. 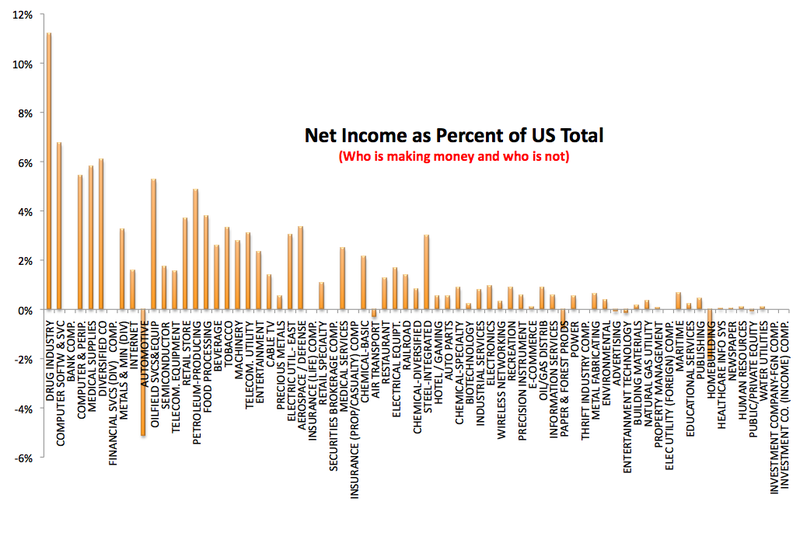 Net Income, basically how profitable they are. As would be expected from looking at the market capitalization graph, the Drug Industry followed by the Software industry are the most profitable. Thus investor's assumptions and actual results are in sync here. Most interesting is the Automotive sector. It is the sector with the largest input into the economy is the most unprofitable of any in the US. Homebuilding though far down in expectations from investors and influence on the economy, it is the second largest in losses. Obviously this is due to the bust of the housing bubble.